The Federal Territory Islamic Council (Maiwp) is not allowed to intervene in Sidang Injil Borneo's (SIB) judicial review application to seek declaratory relief over the 'Allah' issue. However, the Court of Appeal ruled that Maiwp can be an amicus curiae (friend of the court) in the matter. Justice Hamid Sultan Abu Backer said the attorney-general, as the guardian of public interest, is already there to represent the Home Ministry, and as such there is no need for other agencies to be present. “In Malaysia, as well as many jurisdictions in the Commonwealth, the AG is also the guardian of public right and interest, in accordance with the rights of the AG under the English common law in pursuant to Section 3(1) of the Civil Law Act 1956. “The AG is duly represented and vigilant, sufficient in our view to protect the public right and interest within the watchful eyes of the courts, with judges who have taken a constitutional oath to preserve, protect and defend the constitution,” he said. Justice Hamid who led the three-member bench said for this reason, it is allowing SIB's appeal. “As the law stands, the threshold test for intervener is for the applicant to demonstrate direct interest. In the instant case, we do not see how Maiwp will be affected by any order of the court other than a circuitous reasoning which will not satisfy the direct interest test. Maiwp has no rights over and owes no liabilities to the appellants or non-Muslims. “However, we recognise Maiwp has a positive role within the mandate of the Maiwp Act 1993 to assist the court as amicus curiae. In consequence, the order for intervention is set aside with liberty for Maiwp to appear as amicus curiae in the High Court,” said the judge in an unanimous decision. In February, the High Court in Kuala Lumpur allowed Maiwp to be an intervener in the suit. SIB and its president Rev Jerry Dusing, the appellants of this application, had named the Home Ministry and the Malaysian government as respondents, following the seizure of books bearing the word 'Allah' at the low-cost carrier terminal in Sepang in 2007. The books were returned in 2008, just before the general election resulting in Dusing to drop the mandamus order to compel the authorities to return the book, but maintained the 18 declaratory prayers sought. They include the rights to use the word 'Allah' in the Bahasa Malaysia and Bahasa Indonesia translations of the bible, as well as in all religious publications and materials in this country. They are also seeking for the government's decision on May 19, 1986 - that the words "Allah, Kaabah, Baitullah and Solat" are phrases exclusive to Islam and cannot be used by other religion - be declared null and void and contrary to Articles 3, 8, 11, 12, 74, 76 and 80 of the Federal Constitution. SIB was granted leave (permission) for the judicial review to be heard on its full merits on Oct 1, 2014. Lawyer Mohd Haniff Khatri Abdulla represented Maiwp, while SIB was led by Lim Heng Seng. Former Umno deputy minister takes Second MITI minister to task for blaming the people for the country's poor performance in the global competitiveness rankings. PETALING JAYA: Ong Ka Chuan’s decision to blame the rakyat for the country dropping seven places in global competitiveness has baffled a former deputy minister. “What planet is he from?” Saifuddin Abdullah asked when contacted. The Pakatan Harapan chief secretary said one of the problems with the Federal Government was that when an international agency gave Malaysia a good rating, it went on a “trumpet-blowing road show” and made all kinds of claims of how good the government was. However, when given an unfavourable rating, the former higher education deputy minister claimed Putrajaya either brushed it aside or blamed others for it, which in this case happened to be the people. According to the World Economic Forum’s (WEF) Global Competitiveness Report (GCR) 2016-2017, Malaysia was ranked 25th out of 138 economies. Last year, the country occupied the 18th spot. The index is based on 114 indicators that integrate both macro- and micro-economic aspects of competitiveness. These indicators are grouped into 12 pillars, comprising institutions, infrastructure, macro-economic environment, health and primary education, higher education and training, among others. This led to Ong, the second international trade and industry minister, stating that 30 per cent of the report was based on quantitative data from the government and 70 per cent on the perceptions of Malaysians. 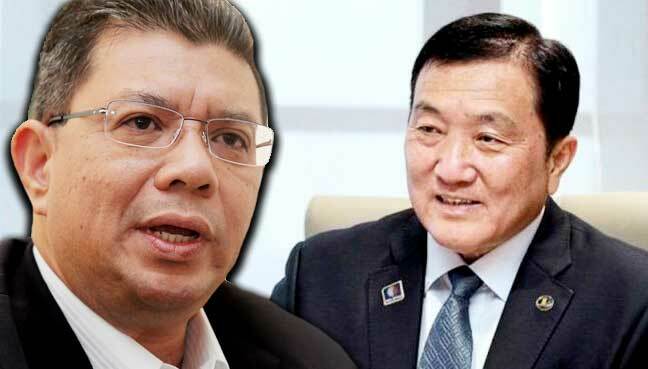 Ong went on to state that Malaysia needed to train its citizens, adding that while he did not expect everybody to paint a rosy picture, they should not condemn the country. Saifuddin, who was formerly BN Temerloh MP but now with PKR, said there was not much optimism in the country and it was “very difficult” to find Malaysians who say good things about the government. Surveys by Merdeka Center and Institut Darul Ehsan, he pointed out, had often revealed how dissatisfied people were. The stand taken by Foreign Minister Anifah Aman of Sabah UMNO that he will not support the Hudud Bill is welcome news. We commend him on being the first UMNO member to openly declare his opposition to the Bill, and for prioritising the harmony amongst the people of Sabah. We are also glad that Sarawak DCM Abang Johari has reiterated Sarawak BN’s opposition to the Hudud Bill, as stated by CM Adenan Satem in April. I have made our stand against hudud very clear on many occasions, both in and out of the state legislative assembly. The importance placed on Sarawak having no official religion and on our freedom of religion is reflected in these points being the first of the 18/20 points in the Malaysia Agreement, and stated clearly in the Cobbold Report. Furthermore, our forefathers had signed the Malaysia Agreement with a secular state, and that must remain so. I hope that our lawmakers will realise that the Hudud Bill is unconstitutional, one of the reasons being that it seeks to empower the state to legislate on criminal law, which is a federal matter. Hudud law will result in different punishments for the same crime depending on the religion of the offender; this goes against the principle of equality for all as guaranteed by the Federal Constitution. Islamic scholars and lawyers have said that it is impossible to implement hudud law in a country that is saddled with injustice, corruption and poor governance. Malaysia being one such country, PAS leaders would do well to focus their efforts on improving the governance of the country instead of pursuing Hudud law. We hope that other UMNO leaders will follow the Sabah and Sarawak BN lead and speak up against the Hudud Bill. We are thankful that there are leaders who have the courage to make a stand on an issue of such crucial importance to us Malaysians. Dare we hope that we can similarly stand together on other issues so plain and obvious such as corruption, injustice, politicising of religion, oppression of the natives over their NCR lands, and the like? For Sarawak and Sabah, it is imperative that we remain united and speak in one voice to reclaim and protect our rights. Should Hudud law ever be implemented in Malaya, we will have to review the Malaysia Agreement and consider our options for breach of agreement. Human rights advocates have slammed the guilty verdict that the Sessions Court handed out to PKR vice-president Tian Chua in his sedition trial today, saying it is a setback for free expression. The Malaysian chapter of rights watchdog Amnesty International (AI) said allowing individuals to criticise the state is crucial to maintaining liberty. “The ruling justifies fears that the authorities will likely continue to use repressive legislation to silence dissenting voices to clamp down on legitimate comment and dissent and indicates a further erosion of legitimate rights under international human rights law and standard,” said executive director Shamini Darshni Kaliemuthu. She called on Malaysian authorities to stop using the Sedition Actand other legal provisions that criminalise peaceful dissent. She said the Sedition Act should be abolished altogether, while other laws that restrict freedom of expression should be reviewed and amended so that they comply with international human rights laws and standards. "We also urge for all charges of sedition against activists, politicians and dissenting voices including the cartoonist Zunar, lawyer Eric Paulsen, activist Khalid Ismath and opposition Member of Parliament N Surendran, be dropped," she said. Meanwhile, PKR vice-president Nurul Izzah Anwar called it a black day for Malaysia. She said that despite Najib's earlier promise to abolish the Sedition Act and replace it with the National Harmony Act, over 30 opposition MPs have been charged for alleged sedition offences. This shows that the BN government, in its desperation to curtail legitimate democratic dissent, still uses such forms of pressure against anyone who expresses themselves vocally, she said. She also lambasted the authorities' apparent double standards, claiming that no comparable action was taken against pro-government supporters when they issued threats that may incite civil disturbance. "We await the fulfillment of the promise to repeal the Act which gives the BN carte blanche to continue to oppress the rakyat by the policy of suppressing the voices of the opposition which is supposed to check and balance the government," she said. Tian Chua was sentenced to three months’ jail and fined RM1,800 in default of six months’ jail at the Sessions Court in Kuala Lumpur today. He was found guilty of uttering “seditious” words in a speech which the court determined had the tendency to incite people against the government post the 2013 general election. His jail term has been stayed pending an appeal. Since Sarawak Report's damaging revelations about 1MDB, its London-based editor Clare Rewcastle-Brown has earned the ire of the Malaysian government. Government leaders have accused her of conspiring with Dr Mahathir Mohamad to topple Prime Minister Najib Abdul Razak while the Malaysian police have also issued an arrest warrant against her. Now, a government-linked source shared with Malaysiakini screenshots of emails that purportedly showed Sarawak Report receiving instructions on its reporting and payment arrangements. However, Rewcastle-Brown, claimed the emails were fabricated. "Totally false. I have never communicated with that person. "It doesn't make sense for a second. Also the email address was made up," she told Malaysiakini. Rewcastle-Brown also took offence over the incorrect use of the English language in the emails, which was attributed to her. The email, dated Feb 23, 2015, was sent from one "Mohd Apandi" to a "Christian Angelo". The email greeted "Christian Angelo" as "Claire" (sic), thanking her for communicating over the phone. It then went on: "Sensitive subject. Already gotten the green light for Phase 2. Please indicate the cost in Ringgit Malaysia. Third party account. Sarawak Report must highlight 1MDB and focus on Najib. Big boss ok with your proposal". The subsequent reply from "Christian Angelo" said it was inconvenient to settle the matter over the phone and asked for a meeting in London. "Nevertheless, I am okay if you guys are okay," said the email. In another email, "Christian Angelo" said: "Many thanks for the confirmation. As agreed, one lump sum payment and the monthly retainer for Sarawak Report is for a minimum of two years, with or without Najib as No. 1". It was then followed with a reply that read: "Roger to that! Would inform you once $ have been wired to your designated account. Look forward to working closely with with (sic)". The emails were six-minutes apart. Sarawak Report had highlighted the 1MDB controversy as early as February last year. In August 2015, Malaysian police issued an arrest warrant against Rewcastle-Brown and sought Interpol's help to detain her, but was rebuffed. In July this year, the US Department of Justice commenced seizure of assets purportedly obtained through funds misappropriated from 1MDB. The details laid out by the DOJ in its 136-page filing for the asset seizure also largely corroborated reports by Sarawak Report in the last year. The DOJ believed at least US$3.5 billion was misappropriated from the Malaysian fund. Najib has denied abusing public funds for personal gain, while Malaysian attorney-general Mohamad Apandi Ali has also cleared the prime minister of any wrongdoing. During a journalism conference in Nepal last week, Rewcastle-Brown denied Sarawak Report was funded by anonymous credit cards as alleged by a website, Open Source Investigations (OSI). Sarawak Report editor Clare Rewcastle-Brown is writing a book on the 1MDB scandal, which she describes as the biggest story in her investigative journalism career. "I might be writing a little less in Sarawak Report at the moment because I am trying to write the biggest story, in a book about the 1MDB investigations," she said. "It will be the story behind the story - how and why I started to cover this scandal. It was quite adventurous!" she told Malaysiakini at the Second Asian Investigative Journalism Conference in Nepal yesterday. The British journalist said she will include issues of timber corruption in Sabah and Sarawak in her book. She admitted it might be hard for her to complete her book by the end of this year, despite wanting to do things quickly. When asked if Malaysians would be able to read the book, she said they would definitely be able to, online. Rewcastle-Brown, who was born in Sarawak, first set up the whistleblower blog in February 2010 to highlight the mass deforestation in the Borneo state. She later focused on 1MDB and the millions of ringgit that allegedly went into the private bank accounts of Prime Minister Najib Abdul Razak, money the government maintains is a donation from the Middle East. The 1MDB saga and the donation issue has pushed massive crowds to take to the streets to demand Najib's registration, with similar numbers expected at Bersih's fifth rally in November. On this, Rewcastle-Brown opined that Najib is unlikely to step down unless a successor can be put in place to ensure he escapes prosecution. "He is undecided (whether to step down)....he wants to keep his money and he wants to keeps (himself) a free man," she said. "I am not entirely sure he feels he can guarantee that if he is in full control; just look at the extra power he has to accumulate for himself because he doesn't feel secure," she said. "I am sure he is thinking the best thing is for him to try and win an election by abusing his power in order to make sure the election is announced in his favour," she said. Attorney-general Mohamed Apandi Ali had cleared Najib of wrongdoing in receiving US$681 million on the grounds that it was a "donation" from the Arab royal family. However the US Department of Justice (DOJ) in its September forfeiture suits to recover allegedly embezzled funds maintains investigations show the money had come from 1MDB. The DOJ said at least US$3.5 billion was stolen from 1MDB and seeks to confiscate US$1 billion in assets acquired in their country, purportedly using the stolen money. Najib had previously denied any wrongdoing when The Wall Street Journal first broke the news about the funds in Najib's accounts in July last year, saying he has never taken public funds for personal gain. Rewcastle-Brown speculated Najib cannot trust his second in command Deputy Prime Minister Ahmad Zahid Hamidi, citing the latter's alleged "track record of betraying others" such as former ally Anwar Ibrahim. "Well, I think he (Zahid) used to work with (former opposition leader) Anwar Ibrahim," she said. Zahid, seen to be previously close to Anwar, was arrested in September 1998 under the Internal Security Act, a day after the then deputy prime minister's first arrest. KUCHING: Three months after the state announced its setting-up, the status of the Non-Islamic Affairs Unit is anyone’s guess at this point of time, despite Christians in the state expressing unease over the pile-up of unresolved religious cases affecting them. Deputy Chief Minister Datuk Amar Douglas Uggah Embas who is in charge of non-Islamic affairs appeared not to be ready to make any announcement pertaining to the status. When met after the launching of World Heart Day 2016 which was graced by Yang di-Pertua Negeri Tun Pehin Sri Abdul Taib Mahmud at Samajaya Nature Reserve (Stutong Park) here yesterday, Uggah quickly brushed off reporters when he was asked to comment on the status of the Non-Islamic Affairs Unit. “My car is here…I have to go,” he replied before being ushered away to his official vehicle. Parti Bansa Dayak Sarawak Baru (PBDS Baru) president Cobbold John Lusoi was recently reported by an online news portal as urging Uggah not to delay naming the head of the Non-Islamic Affairs Unit since it had been quite a long while since the announcement by Chief Minister Datuk Patinggi Tan Sri Adenan Satem on the establishment of the unit last June. Following this, Uggah called for the first meeting with representatives of non-Islamic religious institutions on June 23. Cobbold said there were many issues affecting non-Muslims that needed to be resolved, citing the usage of the word ‘Allah’ by Christians as an example. While not a problem in Sarawak, Cobbold said native Christians feared they might court trouble if they use the word in Peninsular Malaysia. More pressingly, he said Christians and followers of other non-Islamic faiths in the state had expressed concern over PAS president Datuk Seri Abdul Hadi Awang’s Private Member’s Bill to amend the Shariah Courts (Criminal Jurisdiction) Act 1965, which the latter planned to re-table at next month’s Dewan Rakyat sitting. Cobbold said many believed that the Bill, if passed in Parliament, could affect their freedom to practise their religion. Association of Churches Sarawak (ACS) secretary-general Ambrose Linang also reportedly said the association was anxiously waiting for Uggah to name the head of the unit. Ambrose said the association had not been called for a meeting to discuss on the appointment and proposed structure of the unit. He hoped that the head of the unit and its organisation structure would be announced soon to allay the concerns of followers of non-Islamic religions. SIBU: Sarawak is very concerned with the Ministry of Education’s new policy that expanding or opening of preschool classes would be based on additional classes at zero cost. This means preschool classes could only be created without additional cost. Minister of Welfare, Women and Community Wellbeing Datuk Fatimah Abdullah said the Sarawak Early Childhood Education Development Council (MPAKS) and her ministry were very concerned with this directive as it would affect the quality and coverage of preschool education in the state. “The Key Performance Index (KPI) to achieve 100 per cent enrolment of Primary/Year one pupils with preschool experience will be affected,” she said at the closing of the 11th Pre-School Education Convention here yesterday. On another matter, she said the state government was committed to ensure that preschool teachers in the state were competent. To ensure the systematic growth of early childhood education, she said MPAKS and her ministry had developed a blue print for the years 2016–2020. She said by 2020, the target was that 100 per cent of the estimated 123,000 children aged four to six years would receive early childhood education at registered preschool institutions. Seventy per cent of them would study in government preschools, while the rest would be cared for by the private sector. To ensure these families have effective guidelines to follow, MPAKS had come up with the Children Nursing at Home Guide Book. MIRI: The Save Sarawak Rivers Network (SAVE Rivers) views the decision by the state government to carry on with the Baleh dam project is ‘appalling’. The non-governmental organisation (NGO) chairman Peter Kallang stressed that if the state government cared for the well-being of the people, such obsession with mega dam projects must stop. “These dams are obsolete and destructive — thousands of dams are being dismantled in developed countries, which have recognised the ugly facts (about dam development). Sarawak ought to start investing in alternative energy now,” he said in a press statement yesterday. According to studies put forward by the Renewable Energy Laboratory (RAEL) of University of California, Berkeley, the clearing and flooding of forest land to prepare for Bakun and Murum dams as well as the proposed Baram dam, had or could have adversely affected an estimated two-thirds of all tree and arthropod species in Borneo — an island known to have one of the most diverse rainforest in the world. This list also includes those on the International Union for Conservation of Nature (IUCN) Red List of critical and endangered species. The RAEL academicians, Prof Daniel Kammen and Dr Rebekah Shirley, had stated that while alternative energy sources as recommended by their studies would be more focused on the people, the mega dam projects had been and would be largely benefitting corporations and big business owners. “In perhaps the most key finding, we have found that this clean energy mixture can even meet the aggressive seven to eight per cent growth per year scenarios that have been used to argue for the need for mega dams,” Prof Kammen was quoted as saying. In view of the RAEL studies, Kallang said many mega dams around the world were removed because the negative impact that they brought forth far outweighed the benefits. “Even in the United States — the world’s top economy — the dams are continuously being removed,” he added. We were most disappointed to learn about the approval by the Sarawak government for the construction of the 1,285 megawatt Baleh mega dam. On the eve of the Sarawak elections this year, the Chief Minister had said that there would be no more new mega dams in the state, as published in the Borneo Post on 2 May 2016. At the same time, he called on Sarawakians to give him another 5 years to carry out more development, especially in the rural areas. The Chief Minister had also met with and been briefed by world experts from the Renewable and Appropriate Energy Laboratory (RAEL) on the benefits of harnessing renewable energy such as solar, wind, sustainable biomass and micro-hydro instead of the highly destructive mega hydro dams. Studies have shown that the state has no need for the levels of energy projected by SEB, and that the Bakun HEP is operating at half capacity. Even if there is an increased need, it can be met without the building of mega dams, by using micro-hydro in combination with solar or bio-mass power. We call upon the Chief Minister to direct the SEB to publish the cost-benefit analysis studies conducted on the feasibility of the Baleh Dam for review by interested parties. The SEB’s Torstein has pointed out there will be no resettlement issues because the upstream of the Baleh is not inhabited by indigenous communities. This is no justification nor mitigation for pressing on with this dam, which will cause great damage to the environment as well as to the river ecosystems and biodiversity of the area. The Bakun dam has drowned an area the size of Singapore, and its capacity has not been fully utilized. Why has the Chief Minister changed his mind about having no more mega dams? Who are the people to really benefit if the Baleh Dam is to be built? Perhaps the people behind the companies who will get lucrative contracts to supply materials and construct the dam. James Masing and other BN politicians have said that the road development and bridge that comes with dam project is vital for the people as it will spur economic development for the people. I agree that infrastructure development is important, but the price to be paid, ie the destruction of the wider environment, ecosystem and biodiversity, is too high. The primary concern seems to be that the road infrastructure be provided – that can be done without having to accept the dam. It is possible to build roads and bridges without the dam, if there is political will. The Chief Minister is reported to have in the same article quoted above: ‘I don’t care what but let there be light (in all the rural areas)’. His concern appears to be to provide electricity for the rural people. That too, can be done without having to build the mega dam. We urge the Chief Minister to keep to his word and call off this project so as to protect our natural environment for the people of Sarawak. Pada malam sebelum PRN Sarawak tahun ini, Ketua Menteri berkata tidak akan ada empangan mega yang baru di negeri ini, seperti yang disiarkan dalam Utusan Borneo pada 2.05.2016. Pada masa yang sama, beliau menggesa rakyat Sarawak untuk memberi dia 5 tahun lagi untuk melaksanakan lebih banyak pembangunan, terutama di kawasan luar bandar. Ketua Menteri juga telah bertemu dengan dan diberi taklimat oleh pakar-pakar dunia dari Renewable & Appropriate Energy Laboratory (RAEL) mengenai manfaat penggunaan tenaga boleh diperbaharui seperti solar, angin, biomass dan mikro-hidro dan bukannya empangan hidro mega yang membawa banyak kerosakan . Kajian telah menunjukkan bahawa Kerajaan Sarawak tidak mempunyai keperluan untuk tahap tenaga diunjurkan oleh SEB, dan bahawa Bakun HEP ​​hanya beroperasi pada separuh kapasiti. Walaupun terdapat keperluan tambahan, maka ia boleh dipenuhi tanpa pembinaan empangan mega, dengan menggunakan mikro hidro dalam kombinasi dengan tenaga solar, atau biomass. Kami menyeru kepada Ketua Menteri untuk mengarahkan SEB menerbitkan analisasi kajian kos-faedah yang telah dijalankan ke atas Empangan Baleh untuk semakan oleh pihak-pihak yang berminat. Encik Torstein dari SEB telah menegaskan tidak akan ada isu-isu penempatan semula kerana hulu Baleh tidak didiami oleh masyarakat pribumi. Ini bukan justifikasi atau penjelasan untuk meneruskan dengan pembinaanempangan ini, yang akan menyebabkan kerosakan besar kepada alam sekitar dan juga untuk ekosistem sungaidan biodiversiti di kawasan ini. Empangan Bakun telah menenggelamkan kawasan seluas Singapura, dan kapasitinya tidak digunakan sepenuhnya. Mengapa Ketua Menteri mengubah fikiran tidak akan membina empangan mega laig? Siapakah yang benar-benar mendapat manfaat jika Empangan Baleh dibina? Mungkin sesiapa di belakang syarikat-syarikat yang akan mendapat kontrak lumayan untuk membekalkan bahan-bahan dan membina empanga mega itu. James Masing dan ahli politik BN yang lain telah berkata, pembangunan jalan raya dan jambatan yang datang dengan projek empangan ini adalah penting untuk rakyat kerana ia akan merangsang pembangunan ekonomi untuk rakyat. Saya bersetuju bahawa pembangunan infrastruktur adalah penting, tetapi harga yang perlu dibayar, iaitu pemusnahan alam sekitar, ekosistem dan biodiversiti lebih luas, terlalu tinggi. Kebimbangan utama seolah-olah bahawa infrastruktur jalan disediakan. Semua ini boleh dilakukan tanpa perlu menerima empangan, jika ada kemahuan politik. Ketua Menteri dilaporkan mempunyai dalam artikel yang sama dipetik di atas: "Saya tidak peduli apa-apa tetapi biarlah ada cahaya (di semua kawasan luar bandar). Kebimbangan beliau kelihatan untuk menyediakan elektrik untuk penduduk luar bandar. Itu juga, boleh dilakukan tanpa perlu membina empangan mega. Kami menggesa Ketua Menteri untuk mematuhi janji dan membatalkan projek ini untuk melindungi alam semula jadi untuk rakyat Sarawak. It has been 3 months since Bill Kayong was cold-bloodedly shot and killed, but his family is still waiting for the mastermind of this heinous crime to be caught. Last month I asked whether the Malaysian Interpol had requested Australian Interpol’s assistance to arrest Lee Chee Kiang, and whether the Malaysian Government had made a request for the extradition of the suspect. However, there has been no answer forthcoming, and I wish to ask these questions again. In addition, has there been any communication between the IGP and the Federal Commissioner of Police, Australia? The latest revelation was that the police recovered 7 firearms from Lee Chee Kiang’s house. In reply to See Chee How’s questioning of how an individual can have so many weapons, the acting state secretary explained this week that the state government has the authority to issue shotgun licences to plantation companies and that one of the requirements for the companies is that they must have auxiliary police approved by the Royal Police Force. This reply does not provide any satisfactory answers; in fact, quite the opposite as several questions arise from this disclosure. Why does the company need so many firearms? Is there no limit to the number of licences that the Miri District Officer is authorized to issue to one company? Are there no regulations as to who has control of the weapons and where and how they are to be kept? Why does the company have auxiliary police and what actually do these so-called auxiliary police do? Knowing the history of the woes of TR Jambai and the villagers of Sungei Bekelit, who have had to endure cruel harassment and horrific violence at the hands of the plantation employees, many are now wondering whether there is any connection between these ‘auxiliary police’ and the gangsters. Could this close association with the police – having been approved by the RMP – be the reason no action had been taken despite the numerous reports lodged against the employees and the plantation company? This chain of events has given rise to the perception that the plantation, its bosses and employees have been favoured by the police. Are there any other companies and employees enjoying similar relationships? The government must urgently review its policies and practices in relation to possession of firearms, particularly in situations where there is conflict between the powerful companies and the disadvantaged indigenous communities. The lack of acceptable explanations by the authorities continues to cast suspicions on the police in the eyes of the public. An innocent life has been lost, a grieving family is missing their husband and father, and we are all still waiting for justice for Bill Kayong. The least the police can do is to provide some answers. Sudah 3 bulan sejak Bill dibunuh tetapi keluarganya masih menunggu dalang jenayah yang kejam itu ditangkap. Bulan lepas, saya bertanya sama ada Interpol Malaysia telah meminta bantuan Interpol Australia untuk menangkap Lee Chee Kiang dan sama ada Kerajaan Malaysia telah membuat permintaan untuk extradiction/menghangtar pulang sisuspek. Namun, tidak ada jawapan dari pihak berkenaan dan saya ingin bertanya soalan-soalan ini lagi. Di samping itu, adakah apa-apa komunikasi antara Ketua Polis Negara (IGP) dan Pesuruhjaya Persekutuan Polis Australia? Pendedahan terbaru adalah bahawa polis mengambil balik 7 senjata api dari rumah Lee Chee Kiang. Dalam jawapan pemangku Setiausaha Kerajaan Negeri kepada soalan ADUN Batu Lintang See Chee How tentang bagaimana seorang individu boleh mempunyai begitu banyak senjata, beliau menjelaskan minggu ini, bahawa Kerajaan Negeri mempunyai kuasa untuk mengeluarkan lesen senapang-patah (shotgun) kepada syarikat-syarikat perladangan dan bahawa salah satu syarat adalah mereka mesti mempunyai polis bantuan (auxilliary police) yang diluluskan oleh PDRM. Jawapan begini tidak memuaskan; disebaliknya beberapa persoalan bertimbul dari pendedahan ini. Mengapakah syarikat itu memerlukan begitu banyak senjata api? Adakah tiada had bilangan lesen yang Pejabat Daerah Miri berkuasa untuk mengeluarkan kepada sesuatu syarikat? Adakah terdapat tiada peraturan-peraturan mengenai siapakah yang mempunyai kawalan ke atas senjata dan di mana dan bagaimana mereka disimpan? Mengapakah syarikat itu mempunyai polis bantuan dan apakah tugas sebenar yang dilakukan oleh polis bantuan ini? Dengan mengetahui sejarah TR Jambai dan penduduk-penduduk Sungei Bekelit, yang terpaksa bertahan gangguan kejam dan keganasan di tangan pekerja ladang syarikat itu, ramai yang kini tertanya-tanya sama ada terdapat apa-apa hubungan 'polis bantuan' ini dengan samseng-samseng? Mungkinkah perhubungan rapat antara polis - yang telah diluluskan oleh PDRM - menjadi sebab tiada tindakan yang diambil walaupun banyak laporan telah dibuat terhadap pekerja-pekerja dan syarikat perladangan itu? Rantaian peristiwa telah menimbulkan persepsi bahawa syarikat perladangan, pemilik dan pekerjanya telah diberi layanan khas oleh pihak polis. Adakah terdapat juga lain syarikat-syarikat dan pekerja-pekerja yang menikmati hubungan yang serupa? Kerajaan Sarawak perlu mengkaji segera dasar dan amalan berhubungan dengan senjata api, terutamanya dalam situasi di mana terdapat konflik antara syarikat-syarikat yang begitu kuat berkuasa dan masyarakat asli yang berkurang bernasib baik. Kekurangan penjelasan dari pihak berkuasa terus memburukkan nama polis di mata orang ramai. Nyawa seseorang yang tidak bersalah telah hilang, keluarganya telah hilang suami dan bapa mereka, dan kami masih menunggu keadilan untuk Bill Kayong. Sekurang-kurangnya, pihak polis patutlah memberi jawapan yang munasabah. KUCHING: A symposium to showcase best practices on community livelihood and sustainable development by highlanders from Sarawak and Sabah was held at Hilton Hotel yesterday. Organised by the Alliance of the Indigenous Peoples in the Highlands of Borneo (Formadat), the half-day symposium was also held to commemorate the United Nations Development Programme (UNDP) Equator Prize Award 2015 which was awarded in Paris on Dec 7 last year. Formadat received the prestigious award under the Eco Agriculture and Food Security category for their outstanding works in empowering the livelihood of their community. “It is not an easy task for leaders in the highlands to come together to share the same voice and adopt a common vision to maintain and strengthen the cultural traditions and languages of our people in our ancestral lands,” said Formadat Malaysia national chief Penghulu George Sigar Sultan during the opening ceremony. He also revealed that Formadat was mooted in 2013 and officially formed in 2004 by former Ba Kelalan assemblyman, the late Dr Judson Sakai Tagal. Formadat, he further mentioned, is a trans-border community forum established by the main ethnic groups in the highlands of Borneo comprising the sub-districts of Bario, Ba Kelalan and Long Semadoh in Sarawak; Long Pa’ Sia’ in Sabah and; Krayan Selatan and Krayan in North Kalimantan. Among the main roles of Formadat, he added, is to encourage sustainable economic activities such as organic agriculture and eco-tourism. “We promote conservation and sustainable development of the highlands by preserving areas that includes water sources, forests and historical sites,” he pointed out. On sustainable economic activities, more than 100 farmers in Ba Kelalan have applied for good agricultural practises for rice farming under the Malaysia Good Agricultural Practices (MyGAP). The village of Long Rusu, Ba Kelalan, he revealed, is collaborating with an agriculture research centre in using the System of Rice Intensification (SRI) – a method to improve their yield of ‘adan’ rice which is considered by many people in Malaysia as the best rice. “The sale of this rice is an important source of income for some families,” said George, adding that Formadat is also working with the Malaysian Global Innovation and Creative Centre (MaGIC) to train the highlanders on social entrepreneurship. On conservation, he said seven villages in Long Semadoh have adopted 71 rivers and streams that feed into the rice fields. The community, he added, has put up signage at the headwaters of these rivers to inform the public, especially timber companies, of their importance and adoption. “It is a way, a warning not to alter the landscape of these rivers. The idea behind the adoption of rivers and streams is two pronged, which is to ensure clean water for domestic use and for the rice fields as well as for the integrity and health of the forest,” he added. Apart from environmental related activities, he said Formadat is also involved in festivals such as The Bario Food and Cultural Festival that aims to increase awareness of traditional food. He added that this year, Formadat participated in the first Pineapple Festival in the highlands which was held on Aug 6. “These are just some of the activities that members of Formadat are undertaking at different locations. All members of the community are involved in one way or another,” he elaborated. He hoped that more communities from the highlands residing in the villages or living in the cities will be inspired to join forces with Formadat towards a better tomorrow. On another note, he said Formadat was thankful for the support and advice from the Sarawak Forest Department, WWF-Malaysia and WWF Indonesia who had been supportive of their cause. “This consistent support has been and will probably remain an essential contributor to our success,” he added. Sarawak would not adopt the move by the Ministry of Urban Wellbeing, Housing and Local Government to allow private housing developers to give loans to homebuyers. Deputy Chief Minister Amar Abang Johari Tun Abang Haji Openg said this is because such a move could pose financial risks to the developers as the scheme may not be sustainable in the long-term. He said the move may also increase the cost of end-financing, distract developers from carrying out their core business, as well as expose them to borrower default risk over the long-term especially if the homebuyers' credit-worthiness is an issue. "To ensure responsible lending, it would be better and more prudent for the perspective house buyers to secure their loans from established banks and financial institution," he said in a press conference at the Land Custody and Development Authority (Pelita) office at Wisma Satok, Kuching today. On Sept 8, Minister for Urban Wellbeing, Housing and Local Government Noh Omar announced that property developers could now apply to the ministry for a money-lending licence for housing loans of up to 100 percent of a property's value, as it would provide an additional financing source for borrowers who may not qualify for a bank loan. The cabinet was briefed on the programme on Sept 14 after some of Noh's colleagues expressed reservations over it, and later Noh said he had been asked to adjust the plan to avoid misuse, but it was not being abandoned. Abang Johari said in Sarawak, to address the end-financing problem affecting housebuyers, the state government has set up Mutiara Mortgage and Credit Sdn Bhd, a fully-owned subsidiary of the Housing Development Corporation (HDC), to provide loans to the low-income group, and currently it focuses on loans to public housing project under the Public Housing Program (PPR) and HDC's own affordable housing projects. "This lending agency would be a better alternative for those prospective housebuyers who have difficulty in securing loans from banks. However, Mutiara Mortgage and Credit Sdn Bhd will follow the bank loan management standards in processing the loan applications while giving some flexibility to deserving and qualified applicants," he said. He said the government will also continue to intensify its efforts towards implementing public initiatives such as PR1MA projects, PPR, 1Malaysia Civil Servants Housing Program, People Friendly Housing Scheme and MyHome Program. He cited that the state government would also be providing land for the development of future affordable housing projects through HDC and Borneo Development Corporation. Universiti Malaya associate professor Azmi Sharom has proposed that Malaysian companies said to be involved in open burning in Indonesia, be charged by the authorities here, to show the government is serious in curbing the problem. Azmi was one of the panel members in the talk 'Hazy days ahead: legal rights under international and domestic law' at the International Malaysian Law Conference in Kuala Lumpur today. He added, however some existing laws, such as the Courts of Judicature Act, may have to be amended for such action to be taken. The academician said to charge Malaysian companies, the authorities here would certainly need the cooperation from their counterparts in Indonesia. Azmi said there needs to be extra-territorial solutions to counter the haze problems as it has become a regional problem. Meanwhile, Federal Court judge, Justice Azahar Mohamed, pointed to the limitations of an existing country's law to counter the haze problem. Pointing to the Trans-boundary Haze Pollution Act 2014, in which offenders in Indonesia can be punished under Singapore laws for causing haze, the judge said that Indonesia had protested its implementation. Justice Azahar, who was formerly the head of prosecution in the Attorney General Chambers, noted that Malaysia is presently looking at similar legislation, as suggested by a cabinet minister. He also said that if there are criminal offences to be instituted for causing haze, it can only be enforced through the public prosecutor. Another speaker, Etelle Higonnet, who is the campaign and legal director of Washington based firm Waxman Strategies, stressed the need for countries within the Asean region to work together to counter the haze problem, which is not only a regional issue, but also a global one. Higonnet said a study conducted by the Harvard and Columbia Universities, which was released recently, showed that the haze crisis last year had caused 100,300 premature deaths in Indonesia, Malaysia and Singapore. The breakdown listed the number of deaths in Indonesia as 91,600, followed by Malaysia (6,500) and Singapore (2,200). The haze last year occurred between July and November, resulted in schools being closed in Malaysia and Singapore, and causing respiratory and other health problems to the people. The finding was only limited to the impact of haze resulting in the release of PM2.5 particles in the South East Asian region, and not due to other harmful gases. Higonnet also said that in 2006, there were an estimated 34,600 deaths in the three countries as a result of haze. She said Malaysia's case of 6,500 premature deaths last year accounted for 4.29 percent of total deaths in the country last year. The Waxman Strategies director also estimated that the haze problem also accounted for three percent of greenhouse emissions last year, and that deforestation has to stop. Higonnet said the haze was not only affecting South East Asia, but the world. However the Health Ministry has refuted the US study. Similar rebuttals have been made by the Singapore and Indonesian authorities this week. The police force should be the face of human rights and not the face of intimidation, Malaysian Human Rights Commission (Suhakam) chairperson Razali Ismail said today. Addressing the International Malaysian Law Conference in Kuala Lumpur, Razali said one of Suhakam's initiatives was to provide training for law enforcement agencies such as the police, Prisons Department, Immigration Department, Agency for Volunteer Forces (Rela), Malaysian Anti-Corruption Commission and local authorities. "I must confess, here, that this is a mammoth task and Suhakam really has to dig deeper into its raison d'etre and its resources to ensure that all the training and teaching given will have a positive impact on them. These programmes and training do not cover all personnel," he added. Razali, who is a former Malaysian ambassador to the United Nations, admitted that it was just scratching the surface. He said it is vital that the police and other uniformed bodies, from the lowest to the highest ranks, should be equipped with the knowledge and understanding about the value of human rights as the country strengthens security and, at the same time, deals with terrorism. "Regulations are being promulgated in a sweeping fashion that will have the effect of threatening democratic practice and undermine the fundamental liberties enshrined in the Federal Constitution. "In essence, the police should be the face of human rights, and not a face to intimidate, even as the police need to be the bulwark of the country’s security," Razali added. The Suhakam chairperson was speaking generally and not referring to any case in particular. However, recently it was reported that the wife of of former journalist Sidek Kamiso complained that police had arrested her husband without any warrant of arrest. The Suhakam chairperson also reminded ministers and public officers to exercise the powers conferred on them fairly and in good faith, as the rule of law is salutary. “Such powers should not be exercised unreasonably or in excess of their limits. This rule has huge implications. It has to do with the limits of power, the legitimacy of power and the abuse of power, that would eventually open the door to monetary or power corruption. “All agencies and authorities have to ensure that actions taken should be in line with the simple principle of proportionality. “We have to ensure that actions taken would protect the public without undermining the institutions they rely on,” he said. Razali added the rule of law required an independent judiciary as it was in the best position to provide proper checks and balances on the government, in protecting human rights and fundamental freedoms. He said that prior to to 1988, the Malaysian judiciary was considered as one of the most independent internationally. Razali said the Malaysian judiciary went through a turbulent time during the 1988 crisis, which resulted in the sacking of the then lord president of the Supreme Court, and five other judges. “This is a black mark on the history of our judiciary and no attempt should ever be made again to emasculate its independence. “It is crucial that the government implement adequate measures to maintain the independence and impartiality of the judiciary, and to ensure the moral integrity and accountability of its members, in the exercise of its legislative and executive powers,” he emphasised. Former journalist Sidek Kamiso revealed the police tried to provoke him by asking about his religious beliefs and political leanings after arresting him on Monday. This was one of the challenges he had to endure when the police came to arrest him, he said. "They asked me whether I changed my mazhab (Islamic school of thought)... whether I voted for this party, and this and that. "They asked all kinds of questions to rile me up," Sidek told Malaysiakini yesterday. The police raided his house in the wee hours of Monday, for a tweet he allegedly made on PAS spiritual leader Haron Din, who died on Sept 16. The tweet was deemed insulting to Islam. "I was completely flustered, I didn't think about that a warrant is required for a house search. "The fact that I asked one of the officers for his ID was surprising," Sidek said, adding that the police did not explain why they were there. The police, he said, tried to enter the room of his children, but were prevented from doing so by his wife. The incident startled his 14-year-old daughter and 10-year-old son, who thought the house was being robbed, while a friend's 12-year-old son, who was sleeping over, was "shivering" throughout the ordeal. Sidek was grilled again about his religious beliefs while being transported to an office building belonging to the police department on Jalan Semarak. There, he was placed in an empty cell, with just a prayer mat and a bottle of water. However, he had no peace. "I was in the cell, and they just kept vacuuming in front of the cell... I was lying down there, and they just kept doing it. "They started doing it the moment I was put in the cell, it felt like forever, definitely more than 30 minutes." Sidek said he was then transported to Johor Bahru, at 11.30am, and kept in handcuffs throughout the five-hour journey. Despite the restraints, the officers transporting him were a lot nicer he said, and gave him his first meal of the day, a kaya roll, when they stopped at a gas station in Tangkak. "One of the handling officers was very harsh, and lectured me about Islam for a good 10 minutes, and I just listened," he said. His ordeal ended that same night when a magistrate rejected the application from the police to hold him in remand, and Sidek was released after having his statement recorded. The entire incident, which took place in less than 24 hours, left him and his family shaken. "We are going to see a psychologist on Thursday (tomorrow) to assess the situation. If it was traumatic for me, what more for the children? "Even now I can't sleep, just slight noises will startle me. This morning our cleaner switched on the vacuum cleaner and it immediately reminded me of that episode," Sidek said. Asked whether he would sue the police, he said he would consult his lawyer first. He also declined to comment about the tweet in question as it was under investigation, but said that he never had any intention of offending anyone. "I don't go out of the way to hurt people," Sidek said. COMMENT I have a “guilt by association” complex when it comes to journalists or former journalists. While what I write has nothing to do with journalism, whenever a journalist is harassed - someone once told me, once a journalist always a journalist - I have an overwhelming feeling of simpatico for journalists who are threatened by the Umno state. It is ironic that in a fascist state or a state trending to fascism, the written word sometimes becomes powerful in ways that could never be in lands of the free. It is also notable that in such states the police force always reminds citizens that it is the fair and just instrument of the state. Reading the Facebook posting of Norlin Wan Musa on the treatment meted out to her husband, former journalist Sidek Kamiso, is like reading the testimonials of people who live in countries where even the pantomime of democracy has been discarded in favour of whatever kind of tyranny that the state chooses to indulge in. When Norlin asks, “What have we become”, the answer to that question is reflected in the actions of those who invaded her home, menaced her family and dragged her husband across state lines to face charges brought on by cowardly men who file police reports as a means to stifle free speech. This is 1Malaysia in all its glory. What exactly are these “consequences”? If you are going to the United Nations with the intention of “addressing issues such as the refugee crisis and securing global peace”, then the least you could have is a security apparatus that does not issue threats to opposition politicians and harasses former journalists for tweeting about a deceased divisive religious operative. Furthermore, it would behove those who pontificate on such matters, especially on securing global peace and waxing lyrical about having “standard operating procedures (SOPs) and relevant laws in Malaysia to be adhered to by everyone”, to actually have a security apparatus that actually enforces such laws, without fear or favour, instead of patrolling the Twitterverse warning Malaysians against exercising their democratic right in calling for the removal of a sitting prime minister. Apropos everything, this is the IGP who said “I don’t have a problem if they want to ban me from Twitter. If I’m banned, there are 126,000 others who will monitor it” - which just goes to show the priorities of our police force. This of course brings us back to the threat the IGP issued to the honourable representative from Kulai, DAP’s Teo Nie Ching (photo), “not to make statements that could create public unrest". Add to this the horse manure about dealing with a segment of society who have lost respect for the force due to “incitement by certain parties" for their personal agenda. The IGP also “reminded police personnel to be fearless when faced with challenges in the course of carrying out their duties”. “All one has to do is refer to the Royal Commission to Enhance the Operation and Management of the Royal Malaysia Police published in 2005 to address “widespread concerns regarding the high incidence of crime, perception of corruption in the Royal Malaysia Police (Polis Diraja Malaysia, PDRM), and what did this commission discover? I would argue that the only person "politicising” the issue of police investigations is the IGP. First off, the IGP’s comment of a “segment of society” is either a reference to opposition supporters or the Chinese community. Furthermore, his comments about “certain parties” are a clear reference to opposition political parties or personalities, which is a loaded political statement. So much for the objectivity and non-partisanship of the Royal Malaysian Police (PDRM). 1) I do not have an issue with what he tweeted. 2) I do not think he should be sanctioned by the state. 3) I have no issue with his party sanctioning him, for needlessly mudding the racial and religious waters. As usual, I do take exception to the IGP “politicising” the issue by advising “politicians like Jeff Ooi” to be careful of what they post, again implying oppositional politicians, when his establishment brethren have gone to town issuing threats and warnings without sanction from the PDRM. Just one example of how the IGP distorts the discourse. When he writes of certain quarters inciting the public against the police, the assumption is that dissent only comes from the opposition and thus it is the opposition that has agendas against the institutions of the state. This is mendacity at its finest. Of course, there are many examples where the perpetrator and victim are sanctioned as evidence of how the Umno state is fair and just - but this is beyond the scope of this article and fodder for another piece. The day Ali Tinju’s wife makes a Facebook posting of warrantless sleep deprived by agents of the state invading her home and dragging her husband across state lines to answer charges filed against him, even though he was just exercising his right of free speech, is the day "that segment of Malaysian society" who have apparently lost respect for the PDRM may begin to rethink the idea that the PDRM is just another instrument of Umno.